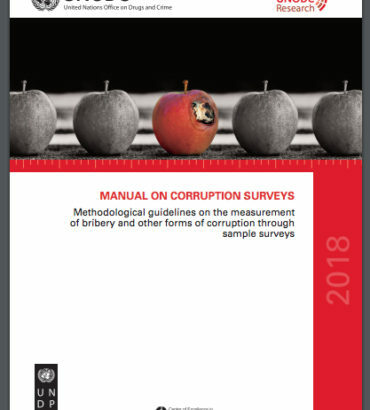 “Good Practices in Public Sector Excellence to Prevent Corruption: A Lessons Learned Study in Support of the Implementation of the United Nations Convention Against Corruption (UNCAC)” makes a strong case that the public sector plays a key role in upholding transparency, accountability and integrity, and vice versa. 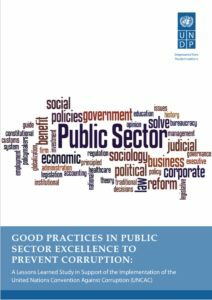 Part I of this study provides a conceptual framework and formulates an operational definition of both “public sector excellence” and “prevention of corruption”. Part II draws on lessons learned from 18 good practices and provides guidance on how these might be applied to the best possible effect in other contexts, while contributing to the implementation of the UNCAC overall. 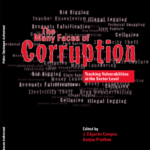 This paper explores the use of prototype road maps to identify corruption vulnerabilities, suggests corresponding warning signals, and proposes operationally useful remedial measures in each of several selected sectors and for a selected sample of cross cutting public sector functions that are particularly prone to corruption and that are critical to sector performance. 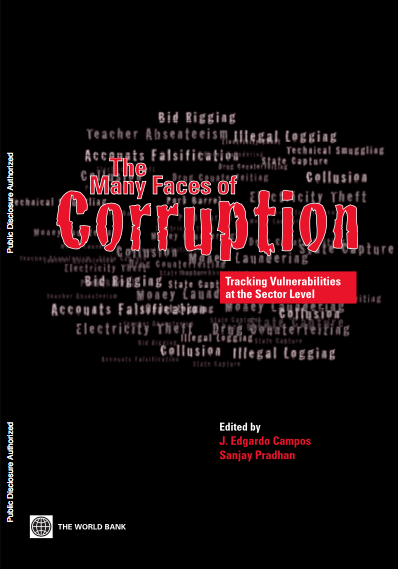 Numerous technical experts have come together in this effort to develop an operationally useful approach to diagnosing and tackling corruption. 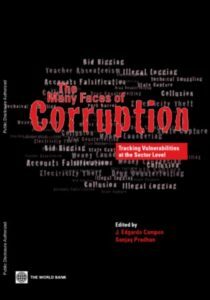 The many faces of corruption is an invaluable reference for policymakers, practitioners, and researchers engaged in the business of development. There is an imperative today to foster sustainable development. A vision for what this encapsulates is laid out in the new sustainable development agenda that aims to end poverty, promote prosperity and people’s well-being while protecting the environment by 2030. As the UN’s Development arm, UNDP has a key role to play in supporting countries to make this vision a reality—putting societies on a sustainable development pathway, managing risk and enhancing resilience, and advancing prosperity and wellbeing. Building on its core strengths—a large country network in more than 170 countries and territories, a principal coordination role within the UN Development System, and the proven ability in supporting efforts to reduce poverty, inequality and exclusion, and protect vital ecosystems—UNDP has outlined a vision in its Strategic Plan 2014-17 focused on making the next big breakthrough in development: to help countries achieve the simultaneous eradication of poverty and significant reduction of inequalities and exclusion. While ambitious, this vision is within reach and significant inroads can be made in eradicating poverty, reducing inequalities and exclusion, and safeguarding the environment. 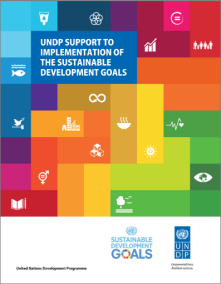 In line with this vision, UNDP has worked with the United Nations Development Group (UNDG) in developing a strategy for effective and coherent implementation support of the new sustainable development agenda under the acronym ‘MAPS’ (Mainstreaming, Acceleration, and Policy Support). The Mainstreaming component of MAPS aims to generate awareness amongst all relevant actors and help governments land the agenda at national and local levels; and ultimately to mainstream the agenda into their national plans, strategies and budgets. The Acceleration component focuses on helping governments accelerate progress on Sustainable Development Goal (SDG) targets, by providing tools that will help identify critical constraints to faster progress and focus on those development objectives that are more relevant to the country context. The Policy Support component aims to provide coordinated and pooled policy support to countries working to meet their SDG targets. In this regard, UNDP offers an integrated package of policy support services that align with its programming priorities. These services, as outlined in the prospectus, cover a wide range of areas: poverty reduction, inclusive growth and productive employment, gender equality and the empowerment of women, HIV and health, access to water and sanitation, climate change adaptation, access to sustainable energy, sustainable management of terrestrial ecosystems, oceans governance, and promotion of peaceful and inclusive societies. Well-equipped with this integrated package of policy support services, UNDP stands ready to support country partners to effectively implement the new development agenda and make long-term economic prosperity, human and environmental well-being a reality. 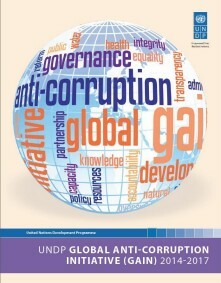 To achieve the objectives of UNDP’s Strategic Plan (2014-2017) and respond to the growing demand from programming countries for policy and programme support on anti-corruption, UNDP launched its Global Anti-corruption Initiative (GAIN) (2014-2017) at the start of 2014. 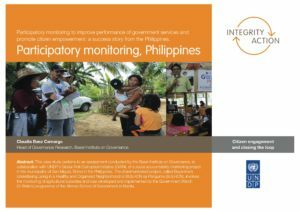 GAIN builds on the successes of the Global Thematic Programme on Anti-corruption for Development Effectiveness (PACDE) (2008-2013) and focuses on strengthening systems, institutions and civic engagement to better manage and deliver public resources and services. 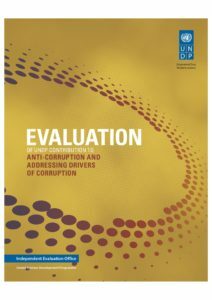 GAIN proposes an integrated and multi-disciplinary approach on anti-corruption through improved partnerships and coordination both within and outside UN system. Today, there is growing evidence and awareness about the impact of transparency and accountability for citizens to enjoy effective service delivery. These linkages have been widely aknowledged by different international and national stakeholders addressing the role of effective insitutions in fosterting economic growth and development effectiveness. 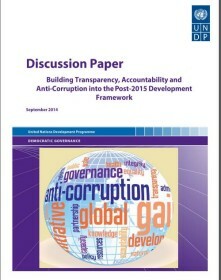 This discussion paper reflects primarily on the emerging consensus on how to integrate the components of accountability, transparency and anti-corruption into the post-2015 development framework. 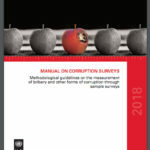 The discussion paper summarizes and presents the views expressed by citizens around the globe about the role of transparency, accountability and anti-corruption in shaping the future international development agenda. 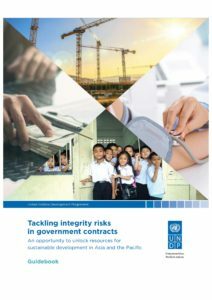 This Guidebook is designed as a practical methodology to help countries diagnose integrity risks in the public procurement system and processes, as well as to indicate proper actions to mitigate them. 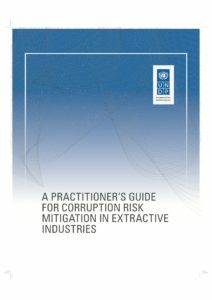 In addition, the Guidebook is designed to help governments in the region upgrade their procurement systems during the Second Review Cycle of the UN Convention against Corruption (2017-2021). 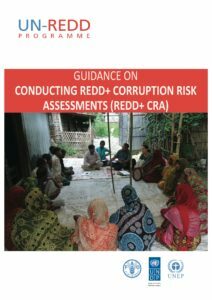 The UN-REDD Programme has developed the Guidance on REDD+ CRA to support countries in identifying corruption risks in REDD+ country programmes and assess the effectiveness of existing risk mitigation measures, and thus initiate a process to develop systems and capacities to mitigate those risks.